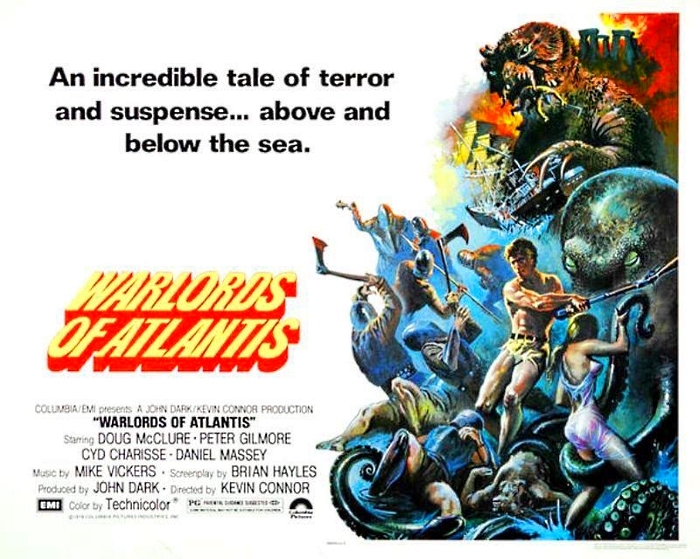 Doug McClure's fourth Amicus studio's fantasy/adventure isn't a sequel to the first three, all of which were adaptations of Edgar Rice Burroughs stories. McClure plays a turn-of-the-century explorer who travels via a diving bell to an ocean-floor kingdom ruled by Cyd Charisse. Younger viewers will be interested in the film's roster of monsters: a giant octopus, a mollusk creature, an eel monster, and several others -- none of which are exceptionally well done, but they're all energetic. Nice sets and matt paintings create the proper Lost Kingdom mood. Directed by Kevin Connor. 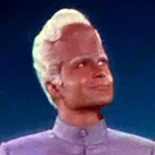 Also starring Daniel Massey, Michael Gothard, Peter Gilmore, Shane Rimmer, and Lea Brodie. Despite the flaws of this and the three previous Amicus studios fantasy/adventure yarns, they still remian the most amnbitious Edgar Rice Burroughs adaptations to date (or Burroughs-like, in this case). ...kingdom ruled by Cyd Charisse. Aaah, that don't seem so great to me . . .
Oh, wait! I was think of Sid Caesar! Silly me! I think it looks like what Captain Nemo would have actually used for exploring the abyss! That's a great idea, Butch! 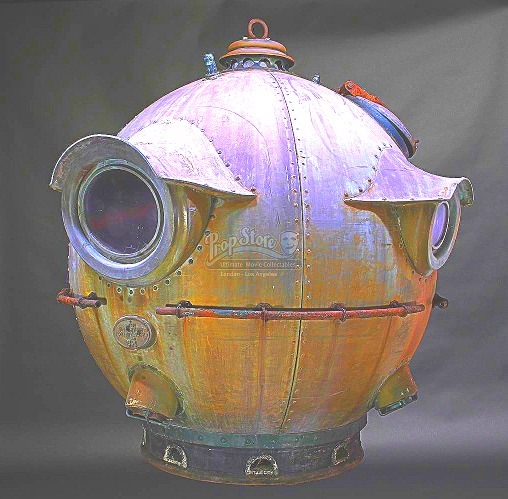 I can picture this diving bell hanging below the Nautilus on a long cable while the sub hovers above, almost at it's maximum depth. Nemo and a few men would be in communications with the ship, and he would direct the sub when to move forward or backward, up or down. In this manner, Captain Nemo could slowly cruise along near the sea floor and make notes and drawings to document what he discovered in the abyss. 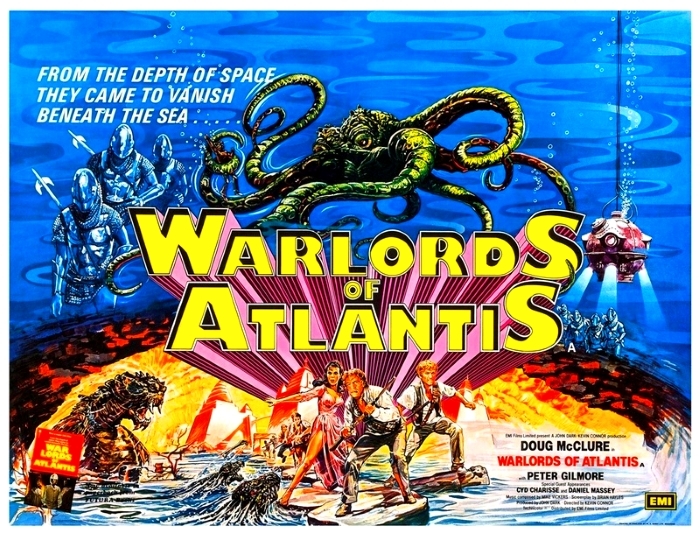 Just watch out for giant squids, who might mistake the bathysphere for food. P.S. For the nerdy here, a diving bell is typically open-bottomed. To be fair, "diving bell" is easier to say. I guess they switched to the bathysphere because with the diving bell the people kept falling out. That's what the clapper is there for; to grab onto.